The Hidden Hotel finds its origins on a philosophy of love and respect for the noblest materials associated with the craft industry and handcraftsmanship. 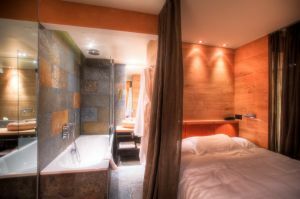 The Hidden Hotel offers a skilful blend of materials, colours and scents in a contemporary yet timeless atmosphere. This unique place will carry you away from the hustle and bustle of the city centre. We strive to use the purest materials in their most natural state. We combine linen with slate, wood, marble, stone, glass and handmade ceramic materials. The Hidden Hotel also incorporates organic, eco-friendly, ethical and modern influences in an eclectic, refined and harmonious blend. We take great pleasure in promoting a sense of mystery, helping guests discover our hidden secrets. For us, each day is an adventure. We try to spark the joy of discovering concealed surprises: treasures, secret spaces and surprising multicultural cuisine, far from the major thoroughfares and the hustle and bustle of Parisian life. At Hidden Hotel, we aim to create a space that reflects this frame of mind, whether you seek peace and serenity or prefer to enjoy spirited conversations with soul mates in travel and adventure. We’ve surely aroused your curiosity - so come soon and discover our secret hideaway! Our team awaits your arrival, ready to offer impeccable and inviting service. The genuine quality of our environment ensures that you’ll fully experience the Hidden Hotel. Near exhibion centre, Centre, Near subway / tramstation. Children less than 10 year(s) old: free of charge. The Hidden Hotel serves a healthy, balanced breakfast from 7:00 am to 10:00 am in the bar (7:30 am to 10:30 am during the week-ends). You can dine with others at the host’s table, or dine alone or with a companion either in a more private space or in your room. On nice days, be sure to enjoy breakfast on our small patio. We offer a large selection of hot drinks, fruit juices, Viennese pastries and rolls, cereals, yoghurt and other selections. We offer original cocktails as well as appetizers and tapas at the bar or in various spaces throughout the hall. Room service is available 24 hours a day. A menu is available in each room. This is an original concept, which can be modified based on your desires and needs. This space is available to our guests and can be booked in advance at the reception desk. Invite friends, arrange business dinners, receptions and even tastings… The Hidden Hotel can also call upon a chef (on request, minimum 3 days advance notice) who will create a dinner designed specifically for your event. The room has a maximum capacity of 19 people. The Hidden Hotel enjoys an extraordinary location on a quiet street in the 17th arrondissement, at the foot of the Arc de Triomphe and a short walk from the Champs-Elysées. 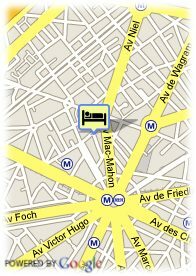 With Place des Ternes and the daily market on rue Poncelet nearby, the Hidden Hotel lies at the heart of Parisian life. In addition, the Porte Maillot Exhibition Centre and the La Défense business district can be directly reached within minutes on metro line 1, which also serves the most popular monuments and attractions of Paris: the Grand Palais, Place de la Concorde, the Tuileries Garden, the Louvre, the Hotel de Ville (city hall) and much more.